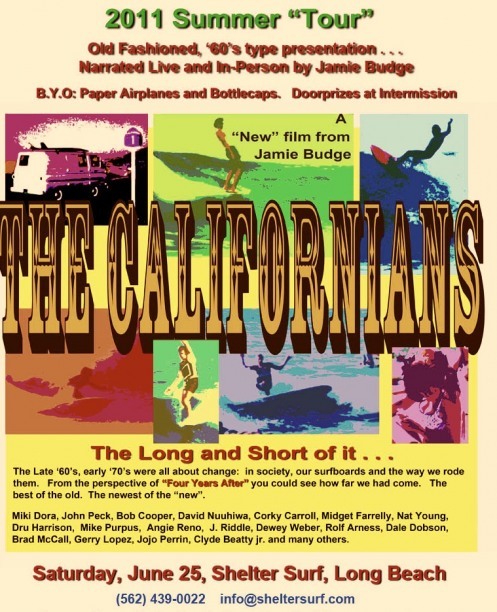 And So the Tradition Returns for the 4th Summer In A Row… Free Outdoor Movie Night At Shelter Surf Shop featuring Jaime Budge’s Classic 60′s/70′s Film ” The Californians” (narrated live by Jaime). There will be new art on the walls of The Residence Gallery, a DJ and Dogzilla Food Truck. Next door, 4th St Vine will be serving up fine Beer and Wine accompanied by live Jazz. The event is FREE! Bring Lawn Chairs, Blankets and Family (and appetites if you like insanely good hot dogs and alchoholic beverages). The Event Starts at 7:30. The Movie will start as soon as the sun goes down!